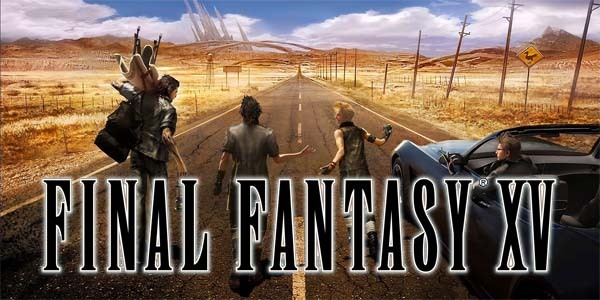 I really don't know what to make of Final Fantasy XV. 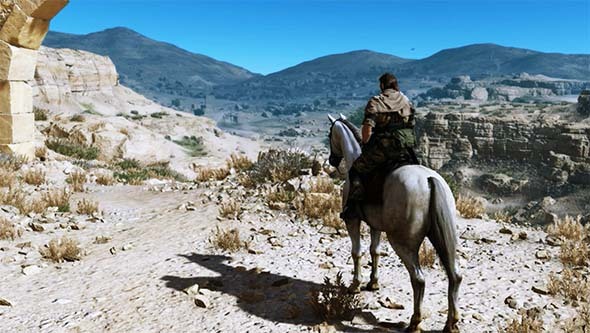 On the one hand, the game is trying to do something new and kind of interesting with the long-stale open world formula. I desperately want to be able to celebrate the game for these new ideas. That being said, the game just completely blunders so much of its fundamental design, and it tramples on many of these promising new ideas by falling back on too many of the very same tropes that have killed so many other open world games. The obvious common criticism of the game is that it's got too much of the player just sitting in the car waiting. You don't even have to drive the damned thing, as you can set one of the NPCs in your entourage to do all the driving for you. And even if you do decide to take the wheel, the car drives itself. You just press the gas, and the car automatically steers itself to stay on the road. You can't even turn off of the road even if you want to. You know what? I'm actually OK with that. You see, having such restrictive travel mechanics actually forces the player to think more about how you're going to navigate the world. While in the car, you are confined to the game's roads and highways. You can't just point the car directly at your objective marker and drive off-road in a straight line to get there. You're also limited to traveling during the daylight hours, and you have to make sure that you budget the time and money to stop for gas and lodgings. There's a genuine amount of logistical planning required for accomplishing virtually any task in this game. You have to think about traversing this world in the same manner that the characters would have to think about it! This is a role-playing game, after all, isn't it? So these travel mechanics are actually pretty clever ways of putting the player in a role-playing mindset and giving you a game to play when you're outside of combat. 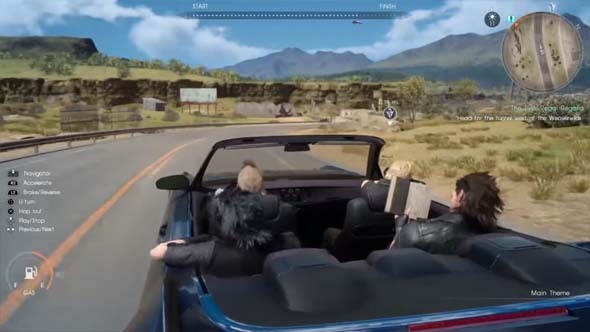 I get the feeling that Square-Enix wanted Final Fantasy XV to emulate being on a road trip. You spend large chunks of time sitting in the car driving across the countryside, passing rest stops, scenic overlooks, and roadside diners. You stop every so often to admire the view, take a walk through nature, or chat with the locals. When the sun sets, you are pressured to find a motel to bunk in, or to set up a camp site if you happen to be on foot. 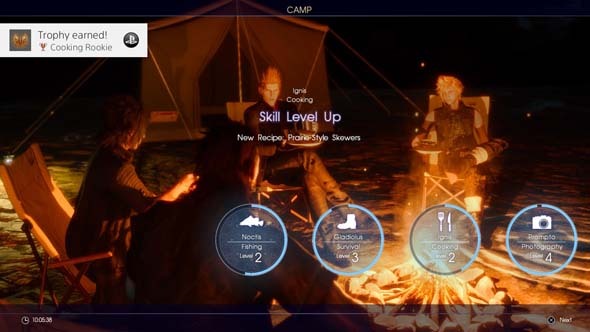 For brief periods of time, this game hits a very serene high in which you start to feel like you're really in this world and with these people, as they sit bored in the car, or eat dinner over a campfire while going over the photos that they took of the day's adventure. It's the same sort of feeling that No Man's Sky hits in its early hours, when you're still awestruck by the sheer size and scope of the new planets you set foot on. Having been someone who used to take annual road trips with my family to visit national parks around the country, seeing a video game try to simulate and systemize that activity (and the human bonding that it engenders) is genuinely endearing and makes me more than a little bit nostalgic. This game makes me nostalgic for the summer camping trips of my youth. Despite being great games, the character development systems of many Final Fantasy games have really weird qualities that put them at odds with the games' narratives. One of the things that separates games from other media such as books or movies is that games are interactive experiences. The best games typically have gameplay that informs story and / or a story that informs the gameplay. This is especially true of RPGs, which are generally designed entirely around their stories and characters. 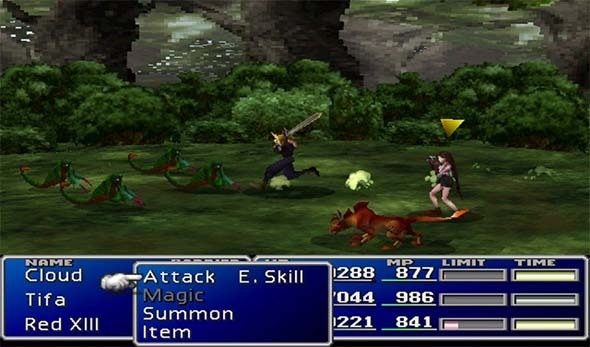 While the combat and character development systems of most Final Fantasy games do have a basis in the game's narrative, some of the Final Fantasy games have gameplay systems that actually pull the player out of the story and create strong disconnects between the gameplay and the narrative. Yet, we still love these games. That is either a testament to the overall quality of the games, or to the general gullibility of gamers. Perhaps the two most popular Final Fantasy games are the worst offenders in terms of having gameplay mechanics that aren't well integrated into the narrative. Final Fantasy VII is widely regarded as best game of the series, and it frequently appears on lists of "the Best Games Ever". Its story, characters, and locations have become iconic. And its primary character-development mechanic, materia, is generally well-received by fans and critics. The materia itself is even a functional object in the game world and an integral part of the plot, instead of just an abstract game mechanic. making all character functionally almost identical. However, this materia system does have one significant drawback: It severely limits the role of the characters in the actual gameplay. 'Final Fantasy XIII' defines a new genre: the "On-Rails RPG." I hope it’s a short-lived genre. This review was originally published 09/14/2010 on Game Observer (now defunct as of 05/13/2014). It has been republished here for archival purposes. Defines a new genre: the "On Rails RPG." I hope it’s a short-lived genre. The "Final Fantasy" name is synonymous with "quality." The idea that any FF game could ever be bad is tantamount to gaming blasphemy. The reputation is well-deserved, as the franchise has consistently provided incredibly compelling characters and story with rich, interesting worlds, and deep customization and character development options. 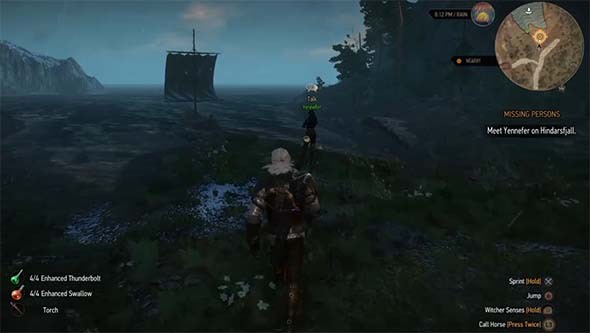 The franchise has completely reshaped the fantasy role playing world. With Final Fantasy XIII, the developers took some radical new directions in every aspect of the game. Unfortunately, these changes severely hurt the game, since they practically take away the need for the player to do much of anything. It reminded me of the girl, Yorda, from the game Ico, being grabbed by the hand and dragged around by Ico all over the castle. In fact, the game could be considered a whole new genre: the "On Rails RPG." Sony's first "Long Live Play" advertisement is released - and it hits the spot! A few weeks ago, I started reading about some new ad campaign that Sony was planning called "Long Live Play". I was kind of disappointed to hear that Sony would be taking a new approach to its advertising, as I actually really enjoyed some of the early Kevin Butler ads. Today, I saw the first advertisement in this new campaign, and it blew me away in terms of creativity and execution! While a "love letter" to the gamer in the form of a TV commercial doesn't make up for losing tens of millions of people's Credit Card information, reminding people of why they love to game is a great first step towards bringing back our business. The advertisement above features many of the most beloved characters in the PlayStation 3 library giving heartfelt thanks to the efforts of one valiant gamer for bringing their stories to life and helping them through their greatest perils.